When fashion designer Karl Lagerfeld was experiencing challenges with his weight, he sought the advice of Dr. Jean Claude Houdret, a doctor that specializes in nutrition. They worked together to create the celebrity diet plan that helped Lagerfeld to lose 92 pounds in just over a year so that he was able to achieve his goal of being able to fit into clothes that were designed for younger and slimmer men. The book commences by outlining the various psychological and behavioral causes of obesity. Dieters are then provided with advice on how to mentally prepare for the diet and develop will power. 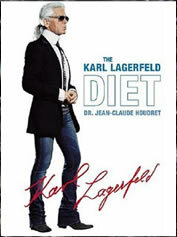 The Karl Lagerfeld Diet is also known as the Spoonlight program. Limiting calorie and fat intake. Avoiding refined and fried foods. Increasing the intake of lean proteins and vegetables. Protein is included in every meal to reduce the risk of unhealthy loss of muscle mass that is common while dieting. Fats are limited as much as possible and carbohydrates are obtained almost exclusively from vegetables especially in the early phases of the diet. The Karl Lagerfeld Spoonlight Diet Involves 3 Phases. Phase one involves consuming only 800-900 calories per day and this phase is advised to be undertaken only for two weeks. Dieters are allowed three meals daily that consist of a protein food supplement and vegetables. This phase should only be used while under medical supervision! Dieters may choose to skip this phase and commence their diet at phase two which involves 1000-1200 calories per day and allows the substitution of the evening protein supplement with a lean protein choice such as chicken breast, fish or meat. A serving of low fat yogurt or cheese is also allowed at the end of the meal. In phase three the calorie allowance is increased up to 1200-1600 per day and dieters are permitted to add whole-wheat toast to their breakfast as well as fruit after the evening meal. The diet involves substituting meals with a protein supplement designed by Dr. Houdret for at least one meal each day. Flavors include chocolate, fish soup, egg based custard, and ham & cheese omelet. Lean proteins, low fat dairy products and vegetables form the basis of the diet in addition to the protein supplements. Fruit and whole wheat bread are allowed in limited quantities in the later stages of the diet. Look for low Calorie and low fat recipes here. Exercise is recommended however its importance is downplayed while the diet is given a much greater emphasis. The Karl Lagerfeld Diet retails for $19.95. The initial phases of the diet are likely to give quick weight loss, which will increase motivation to stick with the program. Realistic time frame for expected long term weight loss results with dieters advised that it may take a year to reach their goals. Addresses psychological factors involved in weight control. Does not require much time to be spent on food preparation. Initial phases of the diet are very low calorie and dieters will likely experience hunger and feelings of deprivation. Most dieters will not find a protein shake meal to be very satisfying. Many recipes include foods that may be expensive, unfamiliar or difficult to find. Gives some potentially dangerous advice such as chewing food and spitting it out which is known to be a trigger for eating disorders. Emphasizes appearance as the major reason to embark on a weight loss plan. Promotes cosmetic surgery such as rhinoplasty, breast augmentation and liposuction ( Vaser, Smart, and Tumescent). Many readers will not relate to Lagerfeld’s attitudes and lifestyle. Unlike most modern approaches to dieting Lagerfeld views hunger and deprivation as a part of weight loss and Lagerfeld even goes so far as to state that dieting has to be a form of punishment. He goes on to say that those who do not have enough determination and will power are destined for failure. Apart from the obvious experience of deprivation that will occur on this diet, the nutritional intake of the dieter will be compromised, especially in the initial phases, and this is bound to have negative effects on the long-term health of the dieter. Perhaps most notable is the almost complete absence of fats, which will lead to an essential fatty acid deficiency. Restricting calories and limiting food variety to such a degree is bound to produce results but dieters must be aware that this will not occur without a serious risk to both physical and psychological well being. don’t agree with everything but i will try some of his tips ! He’s right. Those who do not have enough determination and will power are destined for failure. And not just in dieting. Although probably especially in dieting. Thank you for posting this article. I saw a short version of Lagerfeld’s weightloss story on television and wanted a few more details. I agree with him on some of his quotes and look forward to buying his book and following his lead in a successful weightloss journey. Thanks again for the info. Great article!!! yeah, good article. very interesting. thanks.